So, why do you need to urinate more during pregnancy and how can you deal with it? Below, you’ll discover everything you need to know about frequent urination in pregnancy. Why Do You Need To Pee More When You’re Pregnant? You’ll typically notice you need to urinate more during the first and third trimesters of pregnancy. In fact, frequent urination is seen as one of the early signs of pregnancy. So, why does it happen? In the first trimester, your need to pee more will occur due to two factors – your hormones and your uterus. As your hormone levels fluctuate, this directly increases the amount of urine produced. Your uterus also starts to expand to accommodate your growing baby, placing pressure onto the bladder. So, in the first trimester you’ll not only feel like you need to pee more, but you’ll also be producing more urine than usual too. You should notice the urge to pee reduces throughout the second trimester. This is because although the uterus is still expanding, it starts to expand more upwards, away from the bladder. This in turn reduces how frequently you need to pee. During the third trimester, you’ll find that frequent need to urinate returns. This is because your baby will start to drop further down into the pelvis, again placing pressure onto the bladder. You’ll also start to urinate more frequently throughout the night. If you find your sleep is really disrupted, you can try cutting down fluids before 4pm and this should help you to get a better night’s sleep. Another great tip is to minimize the amount of caffeine you’re intaking as this is known to increase urination. 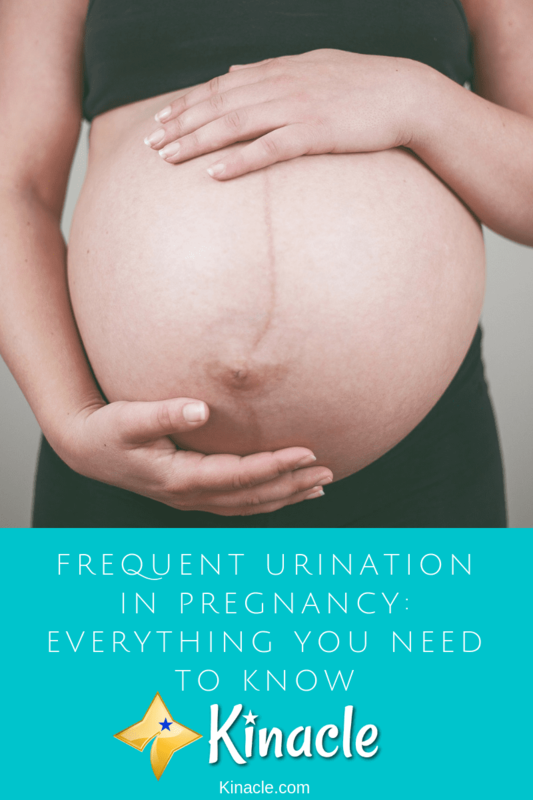 How Much Urination Is Normal In Pregnancy? There isn’t really a definitive answer as to how much you should be urinating during pregnancy. It all depends upon the individual. However, generally speaking when you aren’t pregnant, you’ll find you urinate anywhere from 4-10 times a day. So, during pregnancy you can expect to urinate a little more than usual. It’s not just a sudden urge to pee more frequently that you may experience during pregnancy either. It’s extremely common to develop stress incontinence, particularly during the third trimester. This means, you’ll urinate a little when you cough, sneeze, exercise, lift something or laugh. It can be a frustrating and embarrassing problem, and it’s largely caused by the additional pressure placed onto the bladder from the expanding uterus. It is possible to reduce stress incontinence by working on strengthening your pelvic muscles. Kegel exercises are especially great for this as they can really strengthen the urethra muscles which are responsible for helping you to hold in the urine. You’ll find Kegel exercises online, showing you how to do them effectively. They’re simple to do and can be done anywhere. It’s worth noting that these exercises may not stop stress incontinence, but they will certainly help to minimize it. Occasionally, frequent urination during pregnancy could be a sign of a urinary tract infection. These are more common during pregnancy and you’ll be able to tell if it’s the likely culprit if you have other accompanying symptoms. If you have a fever, pain, a burning sensation or blood in your urine, it’s a sure sign of an infection and you’ll want to seek advice from your doctor. So, now you know why you need to pee more often during pregnancy, is there a way to prevent it? Unfortunately, there is no way to prevent the need to urinate more frequently as it is largely caused by pressure placed onto the bladder from the uterus. However, there are some things you can do to deal with it better. As mentioned earlier, avoiding caffeine can really help. It’s advised you limit your caffeine intake to 300mg a day. You’ll also want to make sure you don’t rush to the toilet. Instead, take your time getting to the lavatory as if you rush, it can set off your “fight or flight” response, causing you to potentially need to urinate even more frequently. Finally, leaning forward while you pee and placing your forearms across your knees can also help to push out more urine. Overall, frequent urination is a common symptom of pregnancy. While it can be frustrating, it is rarely a sign that something is wrong. However, if you are concerned you are urinating much more than you should be, it’s worth seeing your doctor to determine whether or not there is a problem.